No surprise to find that the UK energy policy of financially punishing coal-fired power plants is paying off, as PEI reports. What the consequences may be are anyone’s guess but they don’t look good. British power group Drax could be set to mothball its coal-fired power plants as low gas prices, competition from renewables, withdrawal of government support and the UK’s plan to close its coal-fired plants by 2025 all take their toll. The company announced a strategy review this week after posting a loss of 64 per cent in its pre-tax earnings for 2015, with profits falling from £166m ($234m) to £59m. The group was forced to more than halve its dividend to shareholders, citing “severe market deterioration and difficult regulatory challenges”. CEO Dorothy Thompson was quoted as saying that while the firm “may choose to mothball” its coal plants, “what we are keen to do is to work with the government and find the right solution”. And according to Andy Koss, CEO of Drax Power Ltd, existing coal-fired plants may still be crucial for keeping the UK’s lights on if the government fails to build enough new capacity to make up for the planned plant closures. 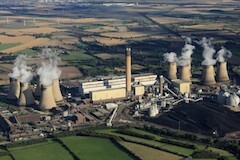 Drax has already converted two of the six units at its 39.6 GW coal-fired plant in North Yorkshire to burn biomass, and conversion of a third unit is planned if government aid for the process passes a European Commission investigation. Koss has warned that unless this aid is delivered within the next two years, the coal-fired boilers may deteriorate to such an extent that conversion would no longer be possible. Earlier this month, Drax and co-plaintiff Infinis, a renewable power firm, lost an appeal to the UK’s High Court over the government’s decision to remove their exemptions from Climate Change Levy payments. Thompson said the exemptions “have played a critical role supporting investment in a wide range of renewable technologies”. That is precisely the outcome that Government Policies were designed to achieve. They are succeeding, but they have no idea what they are doing and the outcome is going to be blackouts and deaths. But they don’t really care unless it impacts their electability. The assumption of 15% output from wind becomes increasingly flaky as coal-fired power continues its rapid decline. Just as A C Osborn indicates, it is another turn of the ratchet that the UK government has inserted the nation’s most sensitive organ into. The pain will only increase. Politicians will be like a cat on a hot tin roof. Repeal the Climate Change 2008 Act. I think Drax has carefully calculated the impact on electability. Pay up or we will join Didcot and the others in stopping supply. Notes in large denominations delivered in plain brown envelope quite acceptable (while lights are still on). As one tutor once said: “those who can (read engineers)>do; those who can’t will outsource”. The latter is always the easiest, especially if ‘money is no object’ since the taxpayer is always available. Who ate the costs of Drax going green and what effect did that move have on their bottom line? As an engineer I don’t believe burning wood chip from the US is cost effective when compared with local sourced coal, government subsidies for going green included.